If there is one graphic that neatly sums up the long-term sustainability of renewable energy, then this could be it, according to a new Bloomberg Report. 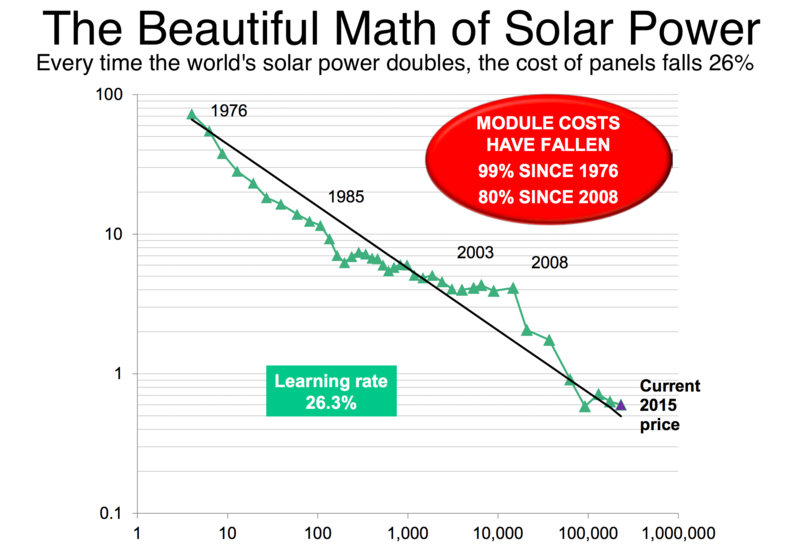 It shows the maths of the rapidly declining costs of solar energy. Falling costs are driving increases in global production of solar energy, reducing our reliance on fossil fuels and are a key part of the battle against climate change. This chart is a powerful reminder of the progress we are making. “It describes a pattern so consistent, and so powerful, that industries set their clocks by it,” explains Bloomberg in a news article accompanying the report. At first glance, the progress made is significant, but look a little closer and it’s even more incredible. The chart is on a logarithmic scale, emphasizing the progress made towards making solar power more affordable. As the bubble on the chart highlights, the fall in module costs has been dramatic. For every doubling in the number of solar panels, costs fall by 26%. This cost is known as solar’s ‘learning rate’. The benefits are already being seen across the world. Consider Morocco’s giant new solar power plant – the Noor-Ouarzazate complex, which is set to power over a million homes. Partly funded with a loan from the World Bank, the scale of the project is a key indication of the progress in solar infrastructure. Solar isn’t only for places with year-round sun either. Germany has the capacity to generate over a third of its electricity from solar – this in a country hardly noted for endless, sun-filled days. Increasing use of solar also reduces the use of coal and gas power plants. As they’re used less, costs increase. This will make renewables seem ever more attractive. It’s fair to say that solar looks set to stay – and the best thing is, the further the technology advances, the cheaper it gets. Is solar set to take over the world?